As mentioned in an earlier blog post I recently travelled to Las Vegas for a last minute getaway out of Toronto. What I had not included was the very unfortunate rocky start my trip had. It all started at 3am when I left my house and made my way to the airport. Upon arriving, my friends and I learned that our flight was delayed by a whopping 13 hours due to what the Sunwing staff referred to as “issues.” Instead of arriving in the morning as we initially planned, we were now expected to arrive late into the night. 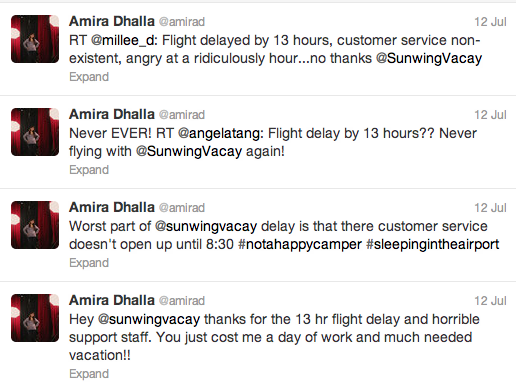 Understandably, loosing a whole day on your 3.5 day vacation was a hard hit. With our heads hung low we left the airport at 6am and crashed at a nearby friends house. I was apart of a large group of angry customers who wanted nothing more than to give Sunwing hell but instead of focusing on what SunWing did wrong, which is now long gone in the past, I decided that it was more imperative to look at what they could have done better. As with many service transactions the service process usually goes a little like this: there is the lead up to the purchase, the actual service and then the post service. It can be common for the post service to be forgotten by both the customer and provider as the service is complete and already off in the distance. I want to identify three problems that occurred during the actual service transaction but would like to stress that there was little post service attempt to keep anyone on the plane a future customer and I find this the biggest mistake of most service transactions. Problem number one; leaving the customer in the dark. Upon finding out that our flight was delayed none of the Sunwing employees at the airport would provide any specifics or answer questions regarding further delays. While being slightly annoyed with the lack of knowledge as to the delay until after we arrived at the airport and AFTER the airline had known for hours, the agent snydly said it was our responsibility to call and ask, as well as they didn’t need to tell us anything. Sure enough this is included in the fine print on their site. The agent gave us a small piece of paper with a cutomer service number to call in a few hours when they were open and ask any questions then. When we told him we were angry and wanted to know if we would be compensated in any way, they threatened to call security. Now I consider myself a fairly understandable person and albeit frustrating know that delays happen all the time, but when you omit information and throw the blame back on the customer you can quickly turn an understanding customer into an angry one. As you are now well aware, I was a bit frustrated at the situation and sent a few tweets expressing my feelings. Okay, I probably sent a couple more than was necessary but at the time I was on a roll. This leading to the second problem, always address an angry customer. They will hold that grudge for a long time and even worst, they will continue to vocalize that anger. I probably would have stopped after my second tweet if someone from the Sunwing community had responded to my Facebook or Twitter comments that they were tagged in. To this day I have yet to ever receive a response or acknowledgement from them. If you’re going to have a social account make sure they are managed because otherwise you run the risk of them becoming graveyards filled with customer complaints. The third problem, but definitely not the last one, is the lack of customer support. After calling the support number that the employee at the airport had promised would direct us to someone who could help, we found ourselves listening to an automated machine with no option to talk to customer service. It wasn’t until we called the head office and spoke to a manager that we were informed that the customer support team at Sunwing was a mear 4 people so they don’t allow any calls. Instead they suggested that we mail the support staff 2 weeks after our flight with any problems and they will try and respond to our concern then. Like most people, I could care less about the problem weeks after I’ve been on the flight which is what I assume they hoped would happen. As luck would have it, when we got back to the airport for the second time our flight was again delayed without notice (and trust me we were constantly checking for updates online). After a total 15.5 hour delay and 23 hours from when I left my house in the morning and arrived at my hotel room in Las Vegas, I was wiped. I should specify that Sunwing did eventually provide a $150 vouchers for our next trip, though like many others on the flight, my friends and I never plan on booking with them again. Another lesson learnt.